Disclaimer: This blog is not to solicit your sympathy, but read at your own will. I had been taking care of this baby, who was born at 25 weeks gestational age. It seems that the mother had been having infection in her uterus that prompted the preterm labor. Studies have already shown the association that inflammatory process in the uterus at the time of pregnancy may also transmit the inflammatory factors to the brain of the fetus, thus the latter is at risk for cerebral palsy, even if he graduates from the neonatal intensive care unit. Another risk that this intra-uterine infection produces is development of bronchopulmonary dysplasia, BPD (otherwise called chronic lung disease of the newborn). BPD is usually considered when a child has a difficulty of tolerating room air (or the baby remains oxygen-dependent) after a certain period of time, when he is already expected to be off from oxygen support. BPD, aside from being a result of an infection, may also be precipitated by other inflammatory processes in the lungs (such as use of mechanical ventilators that induces trauma from volume of introduced air or employed pressure), or volume overload (such as patent ductus arteriosus). My little baby, seemed to have contracted already BPD by two means: patent ductus arteriosus and inflammation from intrauterine infection prior to his delivery. He was already off from the mechanical ventilator on his seventh day of life, but still cannot tolerate being off completely from oxygen. He was given surfactant immediately within few hours from birth, and early x-ray studies showed clearing of the white ground glass picture that was initially seen after birth. After I extubated (removed the mechanical ventilator) on his seventh day of life, I did an x-ray revealing findings consistent with pneumonia or BPD. Considering the prenatal background of his birth, I was moved to treat his respiratory problem as BPD. Gladly, there were no crises arising from it. What was funny though was that every time he attempts to valsalva/defecate, he desaturates and his heart rate slows down. This makes the nurses panic. I reassured them to assist the baby’s breathing as this could be expected from someone with premature brain. So far, there had been no problem. On his second week of life, something unexpected happen. During one of the episodes he was doing valsalva, his heart rate slowed down to the point he was unresponsive to the nurse’s maneuver. I was called to the rescue but in five minutes when I arrived, resuscitation was already ongoing, his heart rate was gone. We continued reviving, and after almost an hour, his heart beat came back. Unfortunately, a brain deprived of oxygen of at least five minutes duration is a poor sign. Yes, baby was revived, but he was not breathing spontaneously already; his breathing depended on the mechanical ventilator. He was also already having seizures as an aftermath. In less than 12 hours from his near death hap, his brain activity already stopped; merely spinal cord reflexes were appreciated. I had the baby referred to a pediatric neurologist, who confirmed the brain’s inactivity. I then talked to the parents and explained the scenario, with full disclosure. After few hours, parents approached me at my office and said they will no longer be aggressive with baby’s care. After his currently medicines will be consumed we will not be refilling/replacing them. Bottomline, if baby’s heartbeat will stop, we will no longer do cardiac pump/massage. This is one of heart-wrenching moments we usually encounter, but it is one reality that we have to accept in our line of profession. The parents and the relatives talked among themselves what to do with baby. Since baby no longer has a chance of recovering, and is solely dependent of medications and mechanical ventilator to keep him alive, this of course would entail exhaustive financial expenses on their part. Weighing financial resources vs benefit/outcome, it would be a loss-loss scenario on their side. They then decided to terminate aggressive treatment and bring home baby instead, considered in the hospital as HOME/DISCHARGE AGAINST MEDICAL ADVICE. How does this work? Once parents are able to settle the hospital bill of the baby, the baby is then brought home by the parents. As much as possible, all contraptions are removed from the baby, except the (endotracheal tube) tube that is connected to the respirator. As the baby exits the nursery, the respirator is replaced by a bag-mask apparatus that is connected to a portable oxygen source. A personnel then does the bag-mask ventilation of the baby until he/she is inside the vehicle that will transport him/her home. Then that is the time now that the nurse/physician will remove the tape that secured the endotracheal tube to the patient’s mouth, and pulls it out. Then it will just be a matter of minutes when the heartbeat will stop. (Strictly speaking, it should be the parents who should pull out the endotracheal tube from the baby’s mouth. But to allay the pain their suffering, we [health care providers] instead do it for them.) This is the most painful part of the grieving I think, watching your baby’s last gasp of air until the heart completely stops. Is this considered euthanasia? I’d rather not classify it. 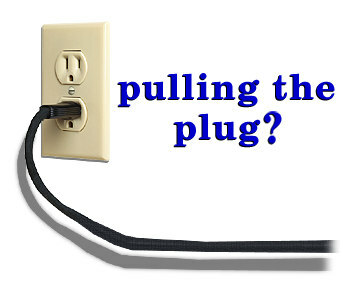 Are the parents guilty of “pulling the plug?” No, they had full disclosure and they just had to appropriate and allocate their resources. Was it ethical? Yes, there was full disclosure of the outcome, they had to consider every aspects – their finances; the baby’s outcome– what would he become of if treatment had been aggressive; their custom and tradition, and their elderlies’ advices, before finalizing their decision. I saw patients at my office for their outpatient consultations and immunization. After my last patient’s vaccination, I heard a loud thud and screaming few seconds when the mother exited the door. It turned out she slipped on a fluid scattered by some irresponsible mammal on the floor. Gladly, the mother held tight onto her 2 months old infant thus was spared from getting hurt. The mother though had her head hit the floor, thus the thud we all heard. We immediately notified the hospital administration about the incident and we brought the mother to the emergency room for consultation and clearance. Meanwhile her baby was left to us. Unfortunately she was hungry. Gladly, the mother gave us milk for the baby to consume. I, my secretary stood as the baby’s nanny while the mother was being attended to at the ER. Baby seems a voracious feeder, I had to find milk while the mom is still being checked. It took almost three hours when the mother was cleared to go home.